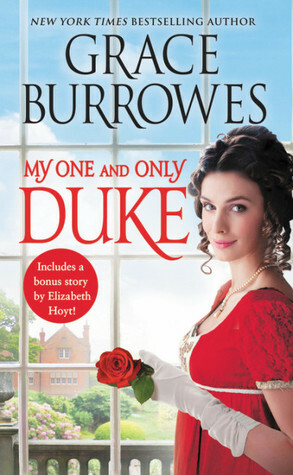 I won a paperback copy of Grace Burrowes‘ My One and Only Duke through Goodreads. One minute, London banker Quinn Wentworth is facing execution. The next, he’s declared the long-lost heir to a dukedom. Quinn has fought his way up from the vilest slums, and now he’s ready to use every dirty trick he knows to find the enemy who schemed against him. Jane Winston, the widowed, pregnant daughter of a meddlesome prison preacher, crosses paths with Quinn in jail. Believing his days are numbered, Quinn offers Jane marriage as a way to guarantee her independence and provide for her child. Neither thinks they’ll actually have a future together. He’s a wealthy gutter rat out for vengeance. She’s a minister’s daughter who must turn a marriage of desperation into a proper ducal union. Are they doomed from the start or destined for a happily-ever-after? This isn’t at all bad. It is, in fact, very sweet. But there is almost no tension in the whole book and the mystery is definitely a sub-plot. The real story is two very different people, who didn’t expect to be thrown together, getting to know one another and falling in love. I liked Burrowes’ writing style though and didn’t dislike either of the main characters, so I would be glad to read more. As for the bonus short story by Elizabeth Hoyt (Once Upon a Christmas Eve), I didn’t like it at all. I suspect Hoyt just isn’t for me. Watching women fall in love with men who are basically dicks to them and hearing their sob stories infuriates me. This entry was posted in books/book review and tagged book review, historical romance, romance, won on March 22, 2019 by Zarah Robinson.